I am an architecture student at Institut Teknologi Sepuluh Nopember in Surabaya, Indonesia. Currently I'm in the 5th-extra year program of professional education of architect, and working in a local architecture firm called Ordes Arsitektur while doing so. This was my bachelor thesis called "The Grid" completed around June this year. The project centered around the problem of how inhumane our city is becoming. The term "homo economicus" was used in the field of economy theory where human was described to be always rational, tries to maximize the utility as a consumer, and maximizes profit as a producer. The term is still relevant today; anything can be measured based on its monetary value. Industrial revolution took place and gave birth to the bourgeois, when the society started to leave the rural region to work and live in the urban area. The arrangement of urban fabric were done to be compatible with the advancement of the machine, consequently expanding the urban fabric. Eventually humans lost their cities, because essentially they had never lived in it, but inside the buildings and all the machines that are assisting them. The urban fabric’s expansion could cause the decline of urban area’s vitality that determines how far the form of spaces can support the function, biological needs, and abilities that humans have. The vitality is needed to bring down crime rates, activating the commerce, and encouraging social activities. In places that had experienced this issue, the decline of population, the change in family and demography pattern, mono economy, and environmental degradation, can be seen as the indicators that the vitality of the urban areas have declined. The bifurcation of a supergrid in city’s spatial logic can be seen as an indicator of the expansion of urban fabric. According to Read and Budiarto (2003), there are two types of urban fabric’s spatial logic in general, which are: a) supergrid with a big and complex movement pattern, forming multiple smaller centers, which are also meeting spaces for smaller communities and the city and its bigger scale; and b) the local scale, characterized by its smaller and simpler activities. Abnormally, there are two supergrids in Jakarta. The first one formed by governmental and large scale commercial area, resulting a dull environment. On the other hand, the second supergrid is right at the first one’s intersections, which spaces directly support the daily life of its dweller’s social and economy, and is more humane. It also connects the local scale with the bigger first supergrid, producing a special condition that benefited its economy. For example a street vendor aided by the city-scale movement passing through every day. A semi-empty lot in Central Jakarta was chosen for the intervention, located between Thamrin’s Central Business District and Kebon Kacang kampong. Some of the unique aspects about this site is that most of it is located behind existing and the currently under construction tall buildings. There is also the Cideng canal that is dividing the site. Illegal parking and traffic jam around are some of the problems surrounding it. Beside general facts about the site, specific characteristic that is related to main issue should be considered. Categorization of the citizen’s activities were done, later to be used as important external factor for the design process. The form finding method first and foremost needed all aspects that can influence design object both from inside and outside of the field of architecture. Once these aspects are determined, design intervention would then be executed accordingly. 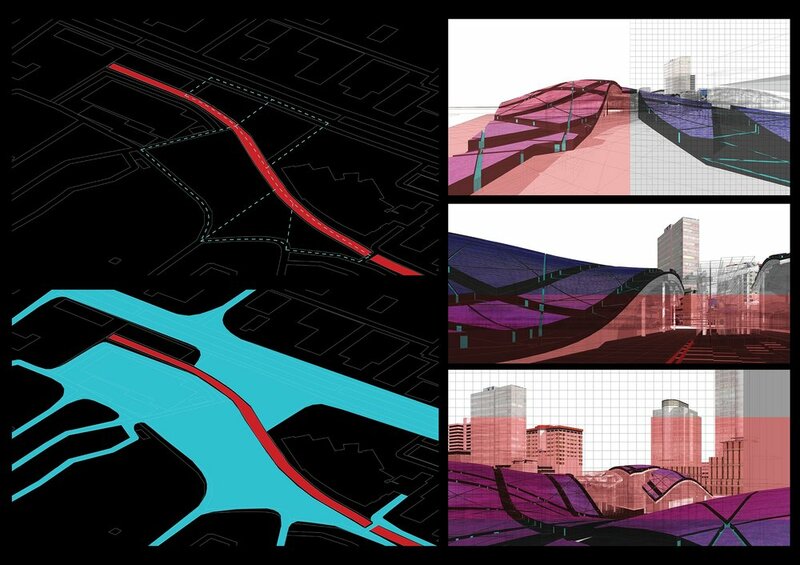 The pattern of the urban fabric became the main focus in considering all the main aspects. Exteriority values would affect a hypothetical grid, forming specific bumps in some of its surface. These bumps are then cut by several factors such as the site’s boundaries, setbacks, and possible trajectory patterns through the site. The contour then experienced an imposition from multiple configurations. The first one was from the grids that are oriented to the prominent vectors of the trajectory cuts. Both supergrids were incorporated, understandably would result in a chaos, but having one grid to determine all the design elements would effectively make the fabric rigid; a contra productive move. A new grid then created parallel to the Cideng canal’s major vector as the governing grid for both supergrids, conceptually mediating the collision. The building itself had to fulfill its human scaled-ness. Beside using several division elements on the form, and getting rid the back-of-house, little pockets of socializing space are also provided between the circulation trajectories.Parking areas, vehicle circulation, and service areas such as the loading dock would be located in the basement.The topo were scaled down of the contour uniformly to create openings throughout the building, and also by using certain architectural elements such as curtain walls with visible grids to further down scale the openings. Complexities of an urban fabric around it is depicted by its form. Reasons such as practicality and efficiency are often used as an excuse to build antagonistic and unreceptive urban fabric. Most of the contemporary urban fabric’s components were built trying to sticking up bigger and taller than the rest. By mirroring the situation around the context accordingly to the form, the new architecture can be a part of the existing urban fabric without being too defined. At the same time, the alien form compared to the surrounding Modernist skyscrapers and small houses in the kampong is a form of lobotomy to the urban surrounding and a manifestation of the undergoing cacophony in its life. In order to fully comprehend the problems in some contexts, factors like the segregation of its people caused by supergrid’s bifurcation is extremely important to be noticed and implemented in the design process. A component of urban fabric should be cohesive to support all the main functions, but at the same time it has to be flexible enough to allow “life” to take place. 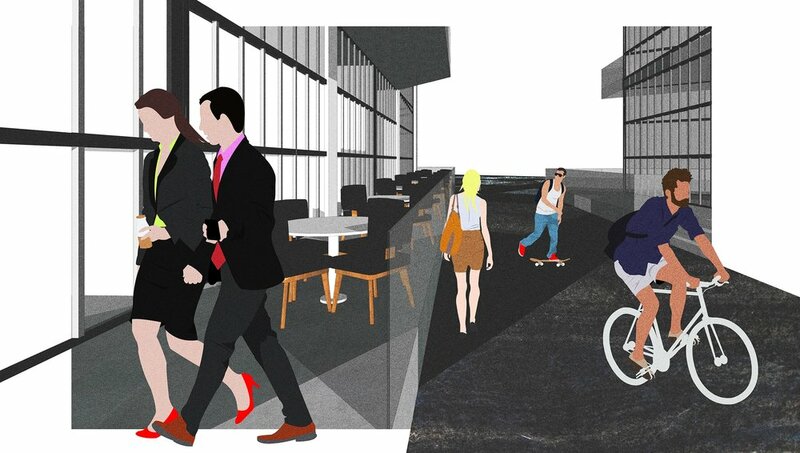 Designing a wide range of possibilities and experiences of its users is the most important thing; how this piece of urban fabric, however small, can be suggestive and inviting instead of imposing and authoritative. This proposal and its ideas in general can be stretched to a larger scale, so that the city, our habitat, can be more than just a tool and a machine, but also the place where we truly live.